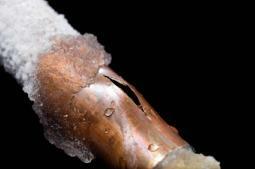 Frigid temperatures make home repair for frozen pipes a useful skill for any homeowner. While no homeowner wants to deal with frozen pipes, knowing how to fix the problem reduces the stress should the situation arise. Water pipes sometimes freeze during spells of extremely cold temperatures. Pipes are more likely to freeze in uninhabited homes that aren't heated, have a low thermostat temperature and have no water flowing through the pipes. Pipes that run through exterior walls are also more susceptible to freezing, particularly when the outdoor temperatures are very low. Pipes that run through unheated areas such as the attic or basement crawl spaces are also more likely to freeze. Frozen water pipes are more than an inconvenience. There is a good chance the pipes will crack or burst because the water expands as it freezes. If damage does occur to the pipes, you'll end up with quite an expensive mess when the ice thaws. The water can cause severe damage to the walls, floors and other parts of the home in addition to the pipes needing replacement. Preventing frozen pipes in the first place is the best course of action for a homeowner. There are several steps you can take to prevent frozen pipes during the cold winter months. Keep a small trickle of water running through the faucets. Flowing water is much less likely to freeze than water that is standing still. Don't lower the thermostat too much, particularly during extremely cold temperatures. If you're going away, never set your thermostat lower than 55 degrees. Add insulation to the exposed water pipes, particularly in unheated areas of the attic and crawl spaces. You can purchase pipe insulation at the home improvement store that you cut to length and place on the pipes. Look for air leaks in the home, particularly near water pipes. Seal these leaks to keep the pipes warm. Add insulation to attics and crawl spaces to increase the area's overall heat level. If it's too late for prevention and your pipes are already frozen, proceed with caution. You'll want to keep an eye out for cracks and other damage to the pipes. These steps can help you thaw the pipes yourself. Locate the water shut off valve before you begin thawing the pipes. Knowing where it is and how to shut it off quickly helps if the pipes do burst. Turn on the faucets in the house. This helps alleviate the pressure on the pipes and gives the water a place to go once it melts. This can also prevent the pipes from freezing completely if they are only partially frozen. Open cabinet doors so warmer air can reach the pipes. Increase the thermostat on the home's furnace to heat up the home. You can also use space heaters to increase the temperature near the frozen pipes. A space heater too near the thermostat can cause the furnace to run less. Use space heaters with caution as they can cause fire hazards. Also be careful not to have too many space heaters running as it can overload the electrical system. Apply rags soaked in warm water to the pipes. When the rags cool, dip them in the warm water again and place them back on the pipe. You can use a hair dryer to apply additional heat to exposed pipes. Keep the hair dryer moving back and forth rather than focusing it on one area of the pipe for a long time. Also be cautious of dripping water which is a dangerous combination with electrical equipment. Shut off the home's main water source if the pipe is damaged. The section of damaged pipe should be replaced before turning the water source back on. Dealing with frozen pipes is a serious project. You need to protect the safety of your home and family. These tips help keep you safe during the process. Never use an open flame, including torches, to thaw the pipes. The flame introduces a major fire hazard into the home. Avoid heating the pipes too quickly. This is another reason torches aren't advised for thawing pipes. If the pipe is heated too quickly, it can cause the water inside to boil and potentially cause the pipe to burst. This could cause injury and damage to the home. Know your limits when it comes to DIY plumbing repair. Incorrect plumbing can cause major water damage to the home. Call a plumber if your attempts are unsuccessful or you don't feel comfortable dealing with damaged pipes yourself. Firsthand experience in home repair for frozen pipes is something that every homeowner hopes to avoid. Knowing how to prevent the damage and handle it if it occurs makes the project a little easier.